Performing a good neurologic examination with proper neurolocalization is critical for devising a suitable list of differential diagnoses with subsequent treatment plans with patients presenting with neurological diseases. The aim of this post is to review functional neuroanatomy and neurolocalization as it pertains to lesions within the central and peripheral nervous systems. As with any examination, being consistent is immensely important. This should begin with reviewing the complete history and performing a full physical examination. The neurologic examination can then be focused upon, again with attention to consistency and documentation. The key to performing an accurate neurologic examination is perfecting one’s examination skills, first on a normal patient. Once one feels confident in knowing what is “normal”, comfort in identifying the “abnormal” and localizing the lesion will come more naturally. When trying to gain a neuroanatomical diagnosis, it is always best to start broadly, then narrow the focus. The intent of the neurologic exam is to “interrogate” or evaluate different aspects of the nervous system that are specific to a particular area. Although there will inevitably be some overlap, ideally the multi-faced aspect of the exam will help indicate the location of the lesion. With an anatomic diagnosis, one can determine a reasonable list of differential diagnoses, with significance granted using the previously reviewed evaluation of signalment and history. 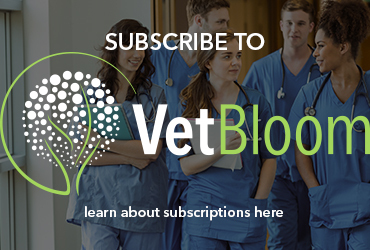 While it is important to have an understanding of neuroanatomy from a global veterinary perspective, being a good clinician does not require an in-depth knowledge of neuroanatomy. Clinical neurology requires only an understanding of functional neuroanatomy and lesion localization is, to a large extent, a matter of pattern recognition. That being said, there are a few neuroanatomical pathways that are important to know (e.g., visual pathway, sympathetic pathway leading to Horner Syndrome, cutaneus trunci reflex). Does this patient have neurological disease? If yes, where is the likely location of disease (neurolocalization)? This may seem very simplistic, but they are important questions to ask yourself with every patient. Never assume that a patient that is weak or unable to walk has a herniated disc or other neurological disorder. Many non-neurologic conditions mimic neurologic disease. For example, a dog that has bilateral cranial cruciate ligament tears or a cat with aortic thromboembolism may be unable to walk. The next step is to consider each of the individual neurologic abnormalities noted on exam and identify where the lesion could be located for each abnormality. This is how I teach students that are first learning how to localize lesions. Case example: You are presented a cat with a sudden onset of circling to the right. On neurologic exam, you discover an absent menace response in the left eye and postural reaction deficits in the left thoracic and pelvic limbs. Now formulate a list of abnormalities and possible lesion locations. Look back at your list to see if one lesion location is present in all of the abnormalities. For this patient, the only location listed for all three abnormalities is the right forebrain. Next, ask yourself if this makes sense to you. The patient is circling, which also can be seen with vestibular disease, but did you see any other clinical signs that would suggest vestibular dysfunction (e.g., head tilt, nystagmus, ataxia)? Always try to localize the lesion to one location, but never forget that multifocal disease is possible. The nervous system can be divided into several functional regions where disease leads to a “typical” group of clinical signs referred to as neurologic syndromes. A great deal of day-to-day clinical neurology involves pattern recognition. 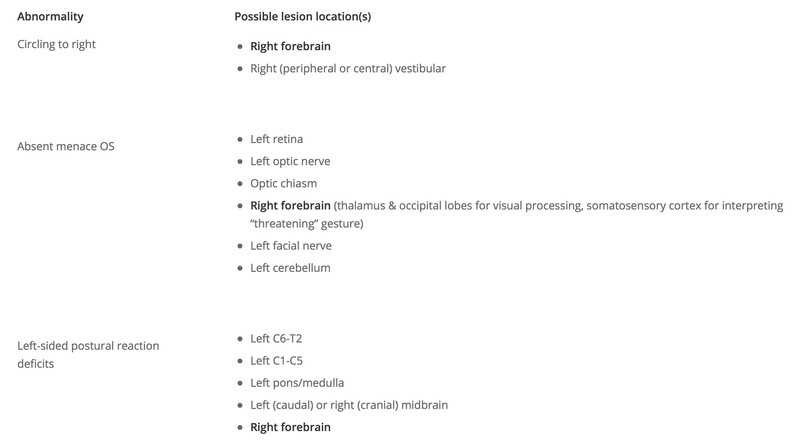 As you become more experienced with the neurologic exam and neurolocalization, you’ll start to recognize these particular syndromes and be able to localize the lesion without having to mentally or physically formulate a list as described above. Listed below are the common clinical signs associated with each functional region of the nervous system, adapted from the excellent veterinary neurology textbook, Clinical Syndromes in Veterinary Neurology by Kyle G. Braund, 2nd ed. The forebrain includes all structures rostral to the midbrain, including the cerebral hemispheres, thalamus, hypothalmus, epithalamus, and subthalamus. The thalamus is anatomically the rostral end of the brainstem, but is functionally similar to the cerebrum. The brainstem consists of the midbrain, pons, and medulla oblongata. Some people separate the clinical signs associated with dysfunction of the midbrain, pons, and medulla oblongata, but it’s often difficult and, quite frankly not very common, to cleanly localize the lesion to just the midbrain or pons. It’s certainly possible for a patient to show only dysfunction of cranial nerves III or IV suggesting midbrain disease, but patients more commonly have clinical signs referable to multiple areas of the brainstem. Important structures in the brainstem include the nuclei giving rise to most of the cranial nerves (III-XII), the Ascending Reticular Activating System (ARAS) controlling level of consciousness, the chemoreceptor trigger zone, and the heart rate and respiratory centers. Additionally, the primary gait generators for dogs and cats are located in the brainstem (likely midbrain), involving the extrapyramidal tracts (e.g., rubrospinal tract). The proprioceptive and corticospinal motor tracts cross in the midbrain. As a result, lesions cranial to the midbrain (i.e., prosencephalon) will cause contralateral postural reaction deficits and/or weakness, while lesions caudal to the midbrain (pons, medulla, cerebellum, spinal cord) will cause ipsilateral deficits. 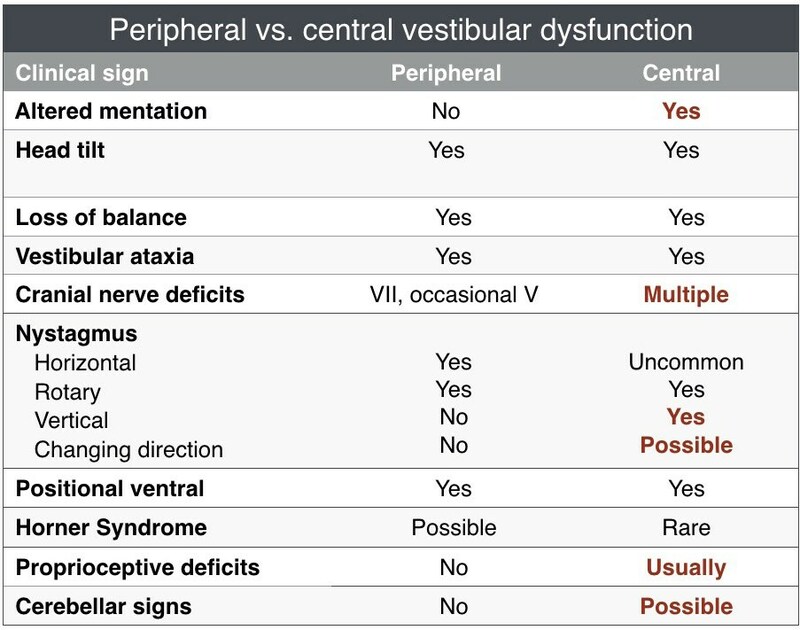 DIstinguishing peripheral from central vestibular dysfunction. NOTE: Disorientation is possible for both PVD and CVD, but patients with PVD should remain responsive. Care should also be taken localizing the lesion in patients whose only sign of central vestibular dysfunction is vertical nystagmus. Some patients with PVD will appear to have a vertical nystagmus when it actually has a slight rotational component. The vestibular system is responsible for maintaining normal body position and coordination. The vestibular system is divided into two portions, the peripheral vestibular system (inner ears, vestibulocochlear nerve) and the central vestibular system (brainstem). There are also vestibular structures in the cerebellum (fastigial nucleus, flocculus, nodulus) and caudal cerebellar peduncle. Dysfunction in these areas of the cerebellum typically causes paradoxical central vestibular signs (see below). With classic vestibular dysfunction, the head tilt and vestibular ataxia are usually toward the side of the lesion and the fast phase of nystagmuus is away from the side of the lesion (nystagmus “runs away” from the lesion). Postural reaction deficits are always ipsilateral to the lesion and indicate the patient has central vestibular dysfunction. Be careful during the early stage of severe, acute vestibular dysfunction because the nystagmus will occasionally look vertical, but it’s actually rotary. In addition, postural reaction testing may be difficult in moderately to severely affected patients. Try to give the patient at least 24 hours before definitively calling a patient central vestibular and/or considering euthanasia (unless other clear signs of central disease are present). Many patients with severe vestibular dysfunction will improve and even return to normal. This is definitely a “don’t judge a book by its cover” situation. At times, the abnormalities noted on exam are suggestive of central vestibular disorder (e.g., vertical nystagmus, postural reaction deficits), but the signs do not follow the “rules” listed above. This is called paradoxical central vestibular dysfunction and is due to disease in the cerebellum or caudal cerebellar peduncle. The paradox occurs because the head signs suggest a lesion on one side of the body, while the postural reaction deficits indicate the other side. Believe the postural reaction deficits as they are always ipsilateral to the lesion in patients with vestibular dysfunction. Occasionally, animals with cerebellovestibular dysfunction will have an absent menace response with intact vision (ruling out an optic nerve lesion) and intact palpebral reflex (ruling out a facial nerve lesion). As with postural reaction deficits, absent menace response is always ipsilateral to the lesion in patients with cerebellovestibular dysfunction. Case example: A 10-year-old MC Greyhound is presented to you with an acute onset of non-progressive clinical signs of right head head tilt, vestibular ataxia, resting & positional left rotary nystagmus, and left-sided postural reaction deficits. In this patient, the head tilt and nystagmus suggest a right-sided lesion while the postural reaction deficits suggest a left-sided lesion. The neuroanatomic diagnosis for this patient would be left paradoxical central vestibular. Otitis interna is the most common cause of bilateral peripheral vestibular dysfunction, but bilateral signs certainly can be observed in patients with other conditions (e.g., hypothyroidism). These patients often are presented with signs of vestibular dysfunction, including vestibular ataxia (often to both directions) and horizontal or rotary nystagmus. Many of these patients do not have a head tilt, or they have a head tilt that intermittently changes sides. Patients often walk low to the ground or crouched and will have wide side-to-side lateral head excursions. Just to confuse things even more, central vestibular signs occasionally occur secondary to a thalamic lesion, most often due a thalamic infarct. This is not very common. It is more important to remember the basic rules of localizing peripheral vs. central dysfunction. The cerebellum is responsible for rate and range of motion, fine motor control, and equilibrium. Disease in this region of the spinal cord typically causes signs of UMN dysfunction in all 4 limbs. Disease in this region of the spinal cord typically causes signs of LMN dysfunction in the thoracic limbs and UMN dysfunction in the pelvic limbs. However, patients with C6-T2 disease may have normal thoracic limbs and abnormal pelvic limbs, especially with compressive spinal cord lesions (e.g., intervertebral disk protrusion/herniation). This is because the pelvic limb spinal tracts are more peripherally located than the centrally located lower motor neuron cell bodies in the ventral horn of the grey matter. Mild to moderate external compression of the spinal cord will compress the pelvic limb tracts first causing UMN signs to the pelvic limbs, while still having normal thoracic limbs. As the compression worsens, the thoracic limb LMNs are affected leading to LMN signs in the thoracic limbs as well. Cervical discomfort/rigidity is often present to help distinguish C6-T2 signs from a T3-L3 lesion. Disease in this region of the spinal cord typically causes signs of UMN dysfunction in the pelvic limbs and normal thoracic limbs. TIP: To help decide whether a patient has UMN signs to all 4 limbs (C1-C5) or Schiff-Sherrington posture with a T3-L3 myelopathy, closely evaluate the postural reactions in the thoracic limbs. With support, a patient with Schiff-Sherrington posture will usually have normal postural reactions in the thoracic limbs, while a patient with a C1-C5 lesion will have delayed or absent postural reactions. Obviously, the presence of thoracic or lumbar discomfort would suggest Schiff-Sherrington while cervical discomfort/rigidity would suggest a C1-C5 lesion. Disease in this region of the spinal cord typically causes signs of LMN dysfunction in the pelvic limbs and normal thoracic limbs. The neuromuscular system consists of the peripheral nerves, neuromuscular junction, and muscles. De Lahunta A, Glass E. Veterinary Neuroanatomy and Clinical Neurology. St. Louis, MO: Saunders; 2009. King AS. Physiological and Clinical Anatomy of the Domestic Mammals: Central Nervous System. NY, NY: Oxford University Press, 1987. Vite CH, Braund KG. Braund’s Clinical Neurology in Small Animals: Localization, Diagnosis, and Treatment. Online http://www.ivis.org/advances/Vite/toc.asp 2006. 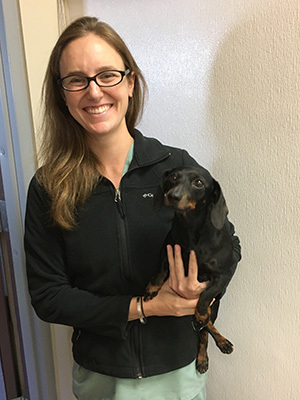 Dr. Riggs received her undergraduate degree in biochemistry from Smith College before pursuing her veterinary degree at the University of Pennsylvania. After graduating in 2010, Dr. Riggs completed a rotating internship followed by a three-year residency in neurology and neurosurgery at The Animal Medical Center in New York City. Dr. Riggs became board certified in 2015. Dr. Riggs takes pride in being a conservative surgeon who performs surgery aggressively when indicated. Her primary interests are in diagnostic MRI and finding non-surgical options for complex neurological diseases. Dr. Riggs also enjoys performing advanced neurosurgical procedures. Dr. Troxel received his veterinary degree from the Iowa State University College of Veterinary Medicine in 1999. Following veterinary school, Dr. Troxel completed a rotating internship in small animal medicine, surgery and critical care at VCA South Shore Animal Hospital in South Weymouth, MA in 2000. He then went on to complete an internal medicine internship at Garden State Veterinary Specialists in New Jersey in 2001. From 2001 to 2004, Dr. Troxel was at the University of Pennsylvania’s School of Veterinary Medicine to complete a residency in medical neurology and neurosurgery. Dr. Troxel became board-certified in neurology by the American College of Veterinary Internal Medicine in July 2004. He has also received a neurosurgery certificate of training. 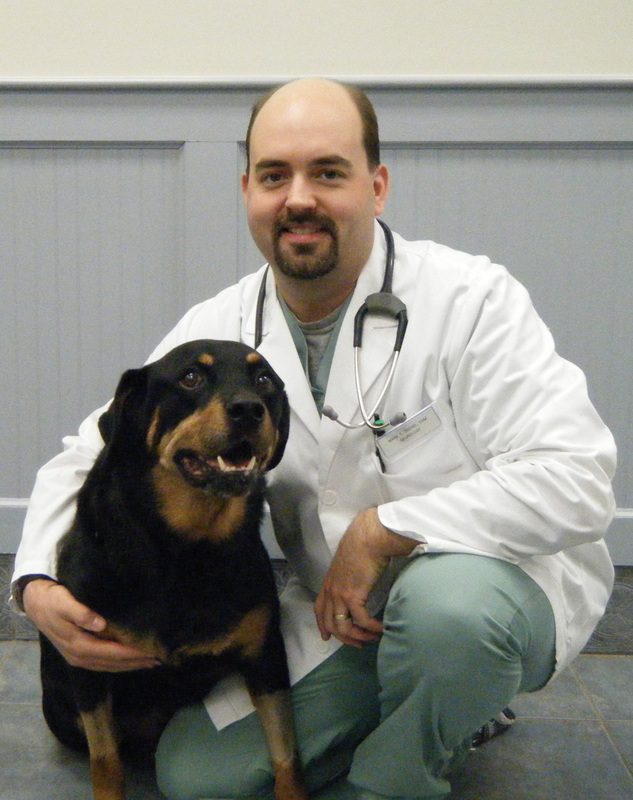 Following his residency, Dr. Troxel served as the staff neurologist at VCA South Shore Animal Hospital until he joined the Neurology/Neurosurgery Department at Massachusetts Veterinary Referral Hospital in 2005. In addition to his love of neurology and neurosurgery, Dr. Troxel is also interested in the use of technology to better care for patients and their owners and to improve efficiency in the veterinary clinic.